Getting a filter stuck on a lens is a quick way to ruin a photo outing or even the balance of a big photo trip. Attempting to remove the filter improperly is a quick way to damage an expensive filter or lens. Push the filter toward the lens itself and twist – again, with even pressure. The pressure toward the lens can allow the threads to release more easily. Try placing a rubberband around the stuck filter. The band gives you more friction which, going back to the even pressure concept, allows you to squeeze the filter less. A rubber dishwashing glove (or similar) can give you friction assistance. A flat, rubber jar lid opener may be the solution. Lay the jar opener flat on a solid, smooth surface and place the lens onto it with filter down. Twist the fully-retracted lens barrel while applying pressure against the jar opener. Care must be taken to avoid damaging the lens when employing this removal method. 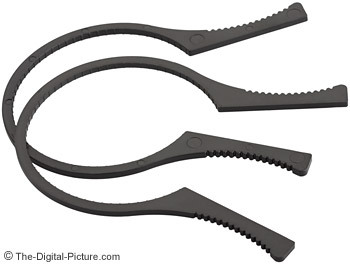 The best filter removal solution is to use an inexpensive plastic lens filter wrench. It doesn't seem to matter how careful I am – I still manage to get stuck filters. Long ago, after getting a Neutral Density filter stuck on a 67-77mm step-up filter adapter ring while on a trip, I finally invested $5 in a pair of lens filter wrenches. There is not much to a lens filter wrench. It is a light, molded piece of plastic that goes over the stuck filter. Squeezing the two finger extensions tightens the wrench around the filter. While squeezing the wrench tightly, twist to remove the filter. The wrench applies the even pressure concept as it grips the filter. Because the clamping edge of the wrench is plastic, the amount of friction natively provided by these wrenches is not stellar. I have not had any problems due to the wrench slipping, but if slippage becomes an issue for you, use the wrench over a rubberband. Note that you loose a small amount of your wrench's diameter capability when using the band. Circular Polarizer Filters are especially hard to remove. The end of the filter turns by design and getting a grip on the remaining thin non-rotating section is quite challenging. A lens filter wrench is especially useful in this situation. Filter wrenches come in pairs. If you have two filter rings stuck together as I did in my example, you can attach a wrench to each and rotate them in opposite directions. Lens filter wrenches fit a range of filter sizes – be sure the set you are buying fits the filters you plan to get stuck. Note that my to-77mm filter wrench works on 82mm filters, but it closes around the filter just slightly shy of perfect. Perhaps the biggest downside to the filter wrenches is that they are modestly large (approaching 2x longer than your filter width). This means a semi-large pocket is needed for stowing in your case. The wrenches have very little depth, so this dimension is of no concern. Being flexible gives the wrenches a cheap feeling, but it also keeps them in one piece when taking abuse in your bag. Lens filter wrenches are an essential part of my kit and they go with me everywhere I use filters. They are so inexpensive that you really have no excuse to not have them in your own kit.